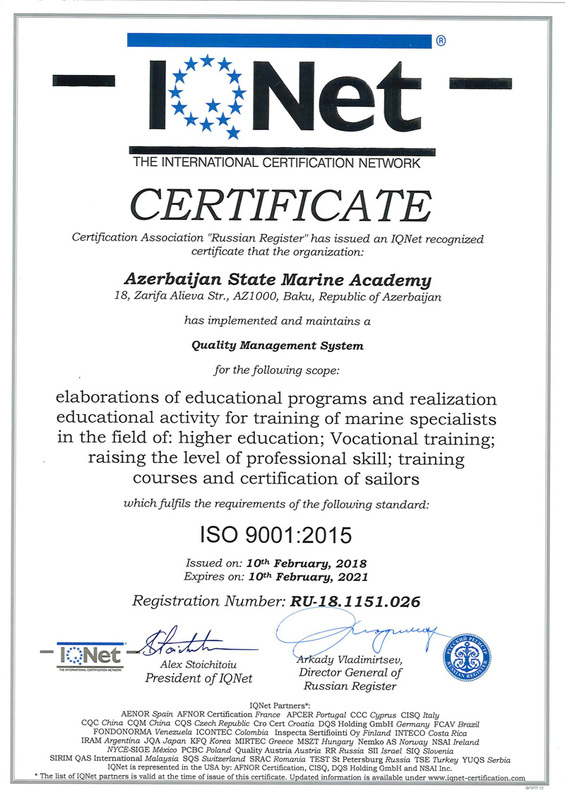 Having considered the requirements of international standards concerning the training and certification of specialists who are employed at sea, the Training and Education Center of Azerbaijan State Marine Academy was established in accordance with the order issued by the chairman of "Azerbaijan Caspian Shipping" CJSC. Training courses, practical classes and their evaluation is being performed at the Training and Education Center for the purposes of certification of seafarers. The two-storeyed administrative building of the Center, located at the address of 23, Salyan highway, consists of modern classrooms and has been equipped with ultimate simulators and marine equipment. 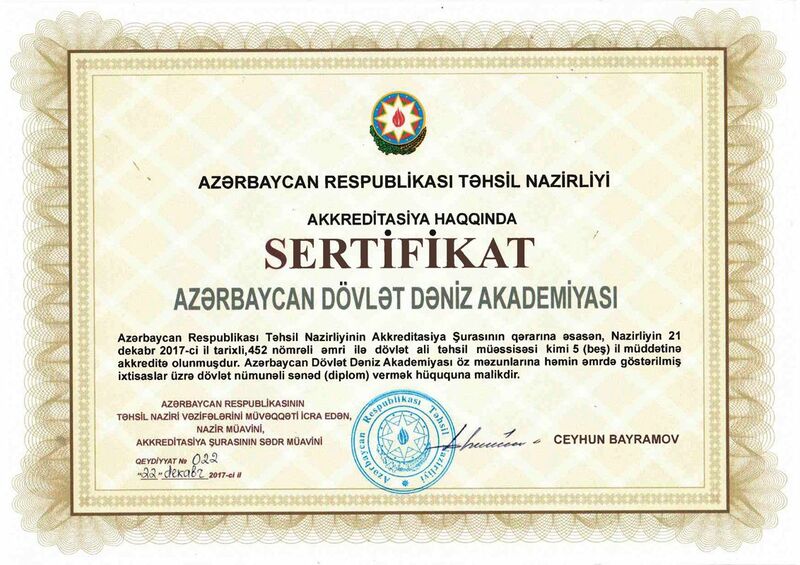 At the same time, III and IV floors of the recently repaired building, belonging to Azerbaijan Caspian Shipping Company and located at the address of 127 Kazim Kazimzada street, were directly delivered at the disposal of the Training and Education Center. Activity processes were enhanced, a new professional personnel team was assembled, curricula and educational aids were standardized, meetings held with new partners and other promotional works were performed at the Center within a very short period of time. Our Center has obtained a variety of certificates from different international organizations and established a higher quality level of education. 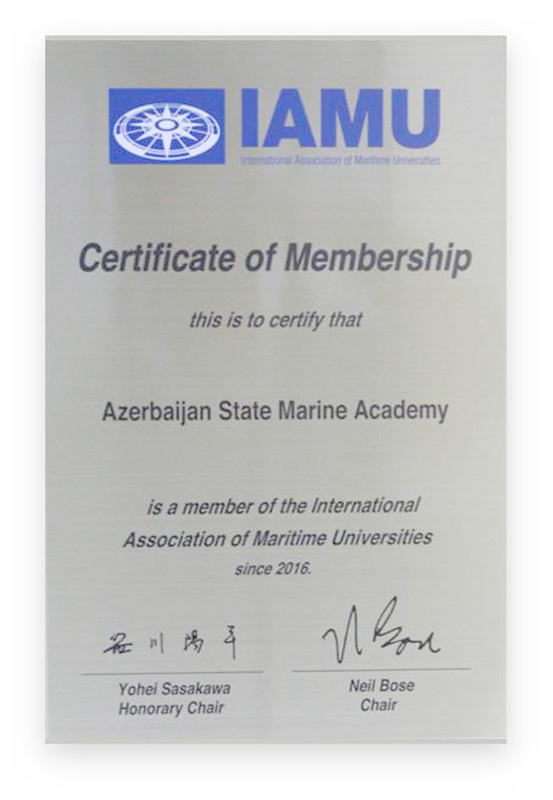 Training conducted at the Training and Education Center was directly accredited by the State Maritime Administration of the Republic of Azerbaijan and the American Bureau of Shipping (ABS). 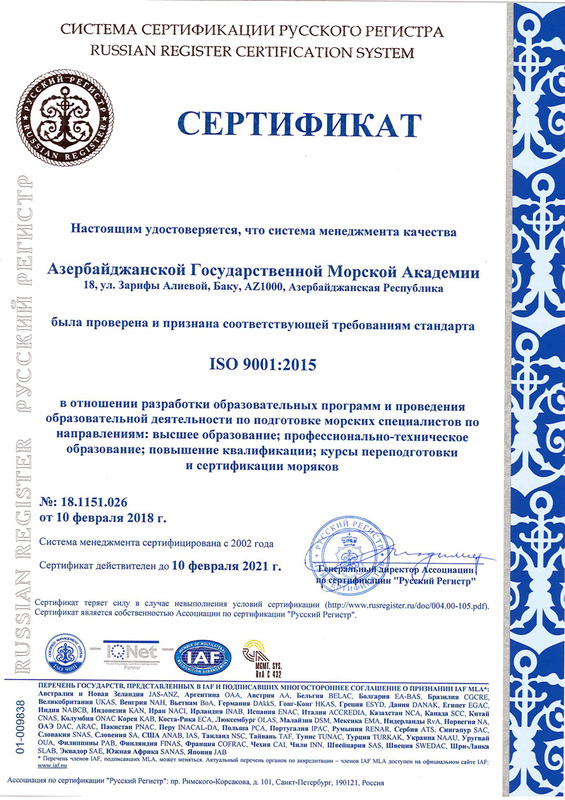 The Training and Education Center has organized its activities and was certified in accordance with ISO 9001:2015 standards of International Quality Management System. 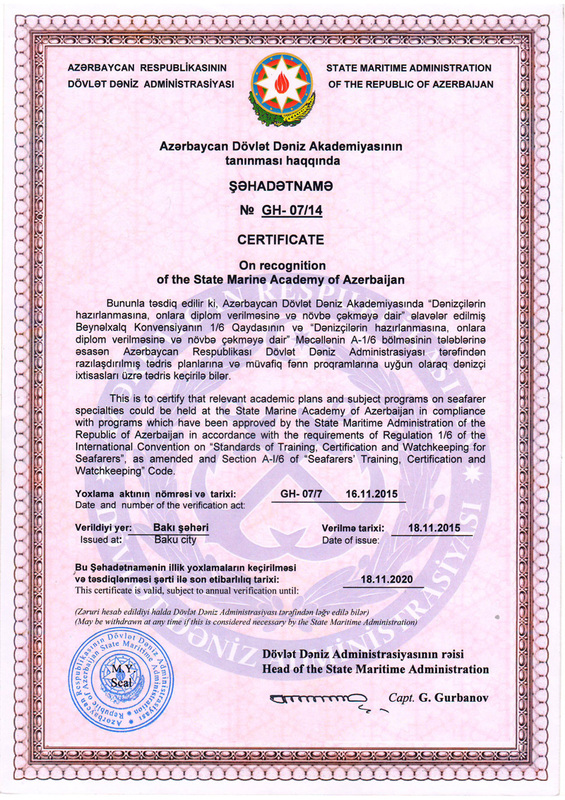 According to the results of the inspection carried out by the delegation of Great Britain`s reputable "The Nautical Institute" which was performed on July 6-7, 2017, the Dynamic Positioning Simulator of the Training and Education Center of the Azerbaijan State Maritime Academy of Azerbaijan Caspian Shipping Company was issued a certificate. This certificate allows conducting "DP Induction" and "DP Simulator" training at the Center. 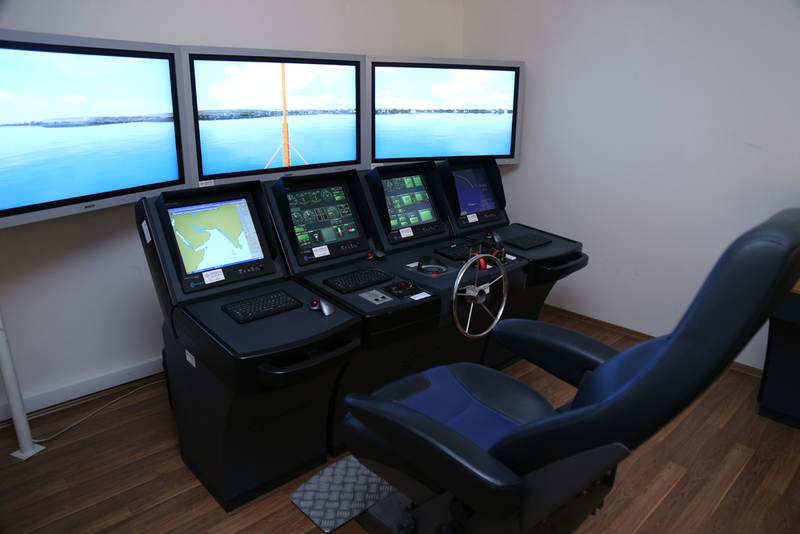 Please also be advised that the Dynamic Positioning Simulator is a computer-controlled system designed to keep the ship's position and the direction of the ship stable. Thus, the Training and Education Center is currently one of the 95 centres in the world entitled to conduct DP Induction and DP Simulator training and the only organization in Azerbaijan. 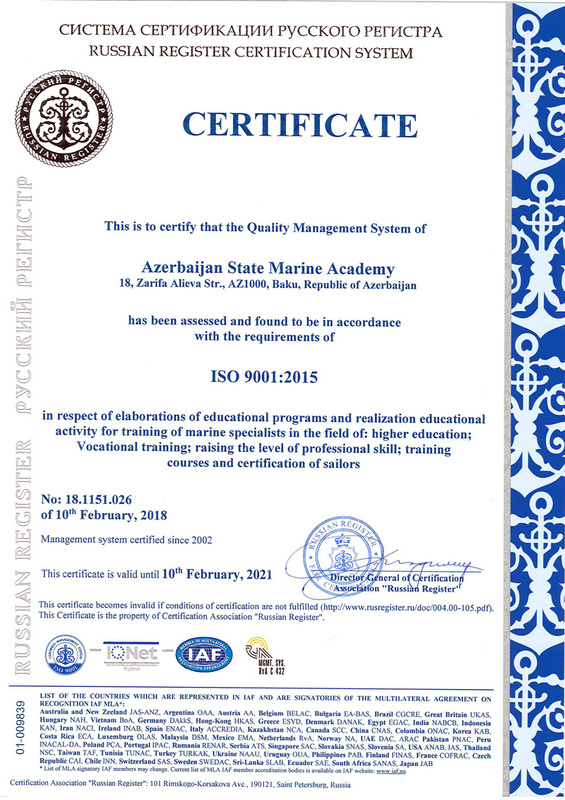 The main purpose of the Training and Education Center is organization of special training courses, as well as, further training and retraining courses for masters of ships, commanding crew and ordinary crew members in accordance with Model Courses of the International Maritime Organization which were annexed to STCW 1978, as amended. Upgrading vocational qualification level of seafarers and offshore personnel, their training on worldwide and international good practice on the sphere of their occupation. 1.Management of the Master Bridge Resources. 2. Ship Navigation and Manoeuvring. 3. Operational Guidelines for Electronic Chart Display and Data Systems. 6. Radar observation and description, Operation of Automatic Radar Observation Equipment (on operational level). 7. Radar, automatic radar observation equipment, master bridge crew and rescue (On operational level). 9. Medical Surveillance on Board Ships. 10. First Aid on Board Ships. 11. An expanded program of fire fighting. 12. Safety induction, preliminary competency and instruction for all seafarers. 13. The specialist on the low-speed rescue boat, duty boat and rafts. 14. Competency on the safety of passengers, cargo and ship`s hull. 15. Competency in management and human behaviour in emergency situations. 16. Competency on safety for crew members serving passengers. 17. Competency in crowd management. 18. The expanded program of competency for cargo operations on oil tankers. 19. Preliminary competency and qualification for cargo operations on tankers carrying oil and chemical substances. 20. Carriage of noxious and hazardous cargo. 21. Shipboard gas detectors and their operation. 25. General competency and instruction on the safety of the ship. 26. Competency of designated persons for the safety of the ship. 27 .Fast rescue boat specialist. 28. Management of engine room resources. 29. The expanded program of competency for cargo operations on chemical tankers. 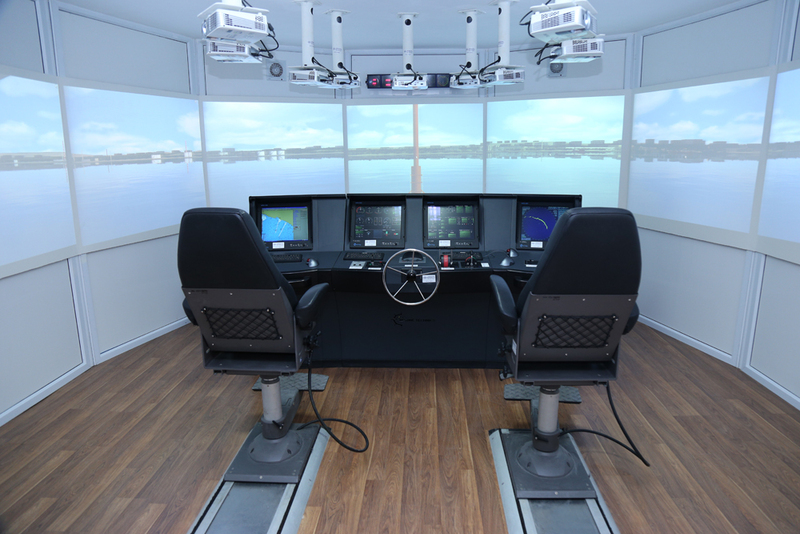 Global Maritime Distress and Safety System (GMDSS)” simulator (manufactured by POSEIDON and TRANSAS companies).